Posted on October 2, 2016 at 12:00 pm. Making the complicated simple is acting in a nutshell. Actors take whole backstories and historical contexts and transform a wealth of emotion and event into simple physical gestures, and simply-spoken lines. Another way to look at creativity in acting is as the point where imagination meets belief – this is the lifeblood of a good method actor. Some imagination is needed to get into the mindset of Hamlet, and see yourself walking through Elsinore Castle – but it is belief that makes you truly become Hamlet to not just the audience, but also yourself. That is the key to a good performance; believing in yourself. If you can’t, neither can your audience. Creativity, then, is what brings reality to a performance. If I were to play Hamlet, I would imagine myself walking through my own hallway instead of that of a fifteenth century Danish castle; this way I really feel that I’m in my home, just like the character does. One way to exercise your imagination is through the method acting technique of sense memory. When you recall a part of your life that is useful to a performance, you must recall every sensation you felt in that memory. For example, when remembering your childhood bedroom, you would explore the sight, smell, sound, touch, and taste of that memory. It takes some creativity to begin with, but your brain can be trained just like any muscle. Soon, you’ll know the smell of that misty morning your father left and will be able to cry on command with no trouble. Recalling past memories is one thing; the creativity comes in when you apply it to your performance. These sense memory emotional aids are sometimes called “parallel experiences”. Christopher Walken shoots himself at the end of The Deer Hunter in an emotional game of Russian Roulette. When asked what he was thinking during the scene, he describes a memory of the summer camp he went to as a child. The memory evokes in him a sense of abandonment and anger, which his character in The Deer Hunter required. In this way, creatively applying your past memories to a present performance can produce a more authentic and effective act. The quality of your acting is affected by your emotional state. If you’re feeling down, your creativity will be shot and your acting will be affected. To get into a creative “mood,” we have to draw on theories of body and mind as interconnected. If your body is creative, your mind will follow – so why not dance? For the next week, spend five minutes before you head out in the morning doing a dance. Find your favourite jam or just turn on the local radio station, and let your body be creative. Jump, clap, sing along – anything to get your body pumped and interpreting the cues around it. You might find the day that follows to be more productive, or at least more positive. Negative emotions don’t necessarily mean you can’t be creative. In fact, many acting methods and techniques aim to produce emotional vulnerability – this is where the stereotype of the highly-strung actor comes from. The idea is to train your brain to react with authentic emotion to a particular set of triggers. This is done using a creative application of your emotions. When you’re feeling down, the last thing you want to do is work – I know. But if you take a moment to become fully aware of your surroundings and your senses in these moments then you can draw on them later, in performance. Improvisation is a class virtually every actor will take, although not many pursue it as their sole style of acting. 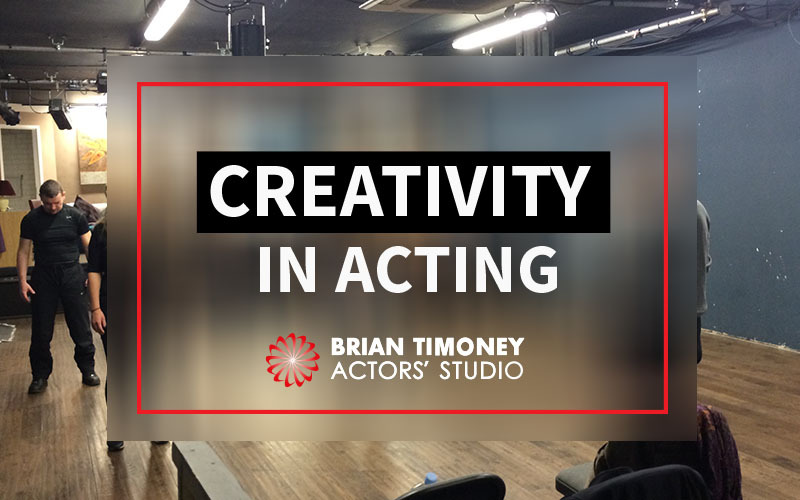 It’s the most intense exercise in creativity and imagination that an actor can take, and as such it’s a good idea to indulge in some improv now and again. For the uninitiated, improvisation is a form of acting in which there are no lines or scripts of any kind. Usually short form and consisting of games, a troupe will take words shouted by the audience and improvise a scene based on it. There are many benefits to performing improv: quick reaction times, comedic catharsis, physical exercise and – most of all – creativity as both an individual and a team member. Studies show that during improvisation, actors’ brains become fully immersed in self-expression and the self-monitoring part of the brain shuts down completely. This means that creativity is allowed to flow unhindered, like the actors’ version of a dance. Improvisation allows for instant feedback and self-improvement, helping an actor to hone their character and techniques. While not all creatives are actors, many actors are creatives. Thankfully, even if you’re not naturally creative there are habits you can learn to enhance your creative potential. Flexibility is an adjective that follows creativity on most resumes, and it’s how the most creative people live. Work the hours that are your most productive, whether they’re 9-5 or from midnight to midday. This is because the rest of a creative’s habits depend on high levels of alertness and productivity; you must be at your peak performance. Creativity is, largely, an act of improvement; on your own work and that of others. Creative people observe everything around them – pieces of art, public transport, and small conversations – and expand and improve on them. When someone calls themselves a “creative,” our minds immediately go to art and theatre. The word creative conjures up wild emotion, authenticity, and colour – and that is exactly what you, the actor, create when you use your creativity on the stage. 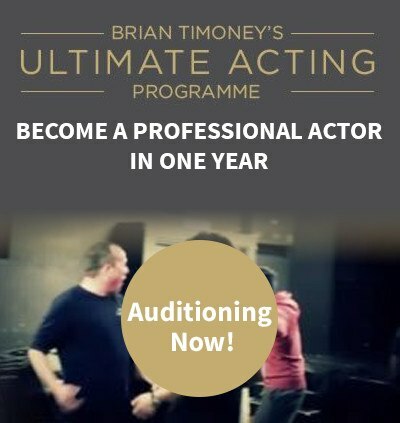 In Brian Timoney’s Ultimate Acting Programme we take students who we can see a creative spirit in, who we know are passionate and driven by film and theatre. If you are open to vulnerability, dancing, and the freedom of creativity in acting – apply for the programme.